This Figma was first shown off over a year ago, but is only now getting ready to actually go on sale. It's been worth the wait. 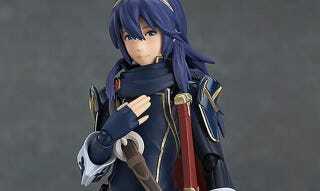 Figuring we're past the statue of limitations on spoilers (and really, it's been long enough), this Figma piece is dropping the Marth charade and labelling itself a Lucina figure. She'll still ship with the mask though, in case you want to act surprised (along with alternate facial expressions). While you can now preorder the figure from various import sites (like Hobby Search), it won't go on sale until April 2015.